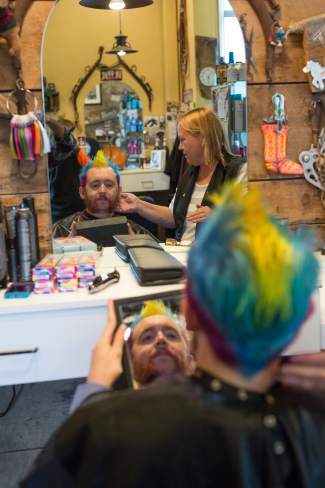 Shelly Lash-Doyle puts the finishing touches on Nick Dawson's rainbow mohawk at DJ's Hair Shoppe in Edwards on Tuesday. Dawson, who works for the Eagle Valley Library District, used the hairstyle as a way to incentivize kids to participate in events and activities sponsored by the Gypsum Public Library. GYPSUM — For Nick Dawson, getting a rainbow-colored fauxhawk seemed like a good idea at the time, especially if it got teenagers reading during the summer. “If dying my hair gets them into the library, then I’m happy to do it,” Dawson said. It did, and he is happy. Dawson is a teen librarian in the Gypsum library, part of the Eagle Valley Library District. Dawson’s mission — as tough as anything faced by Mr. Phelps and the Impossible Mission Force — was to get teenagers into the library during the summer, and get them to read. This summer’s reading theme was Superheroes. Go ahead and put a cape on Dawson, because this stuff is classic. To reach their goals the kids earned points by volunteering at the library, reading books, reading graphic novels, reading comic books, or watching super hero movies. Also playing super hero video games at the library counted. Dawson awarded away points for just about anything. “One kid got points for wearing Captain America socks,” Dawson said. The Gypsum library crew is upgrading its teen center to make it more of a tech center. They do their summer reading for school. They also play Dungeons and Dragons two or three times a week — less now that school is about to be back in session. He even teaches a little Mine Craft. “It’s a good way to sneak in writing code and engineering,” Dawson said. All that’s wonderful, but you really want to hear about Dawson’s hairdo. Turns out, it was the first prize box the kids unlocked. Dawson just laughed. He does that a lot. Dawson did rule out a few things, such as no shaving swastikas into his head. “You know teens. You have to try to be pretty specific,” Dawson said. His wife had to approve, and she did, sort of. She didn’t want anything that took too much time in the morning to style. Shelly Lash-Doyle with Shelly’s Hair Care did the style and dye job. It was a little like Michelangelo’s David when the Renaissance artist explained how he did it: “Cut off everything that doesn’t look like David,” or words to that effect. Lash-Doyle applied those same time-honored principles for Dawson’s fauxhawk. It took four hours. She cut off Dawson’s excess hair and bleached it. They talked about the color lines he wanted, a conversation a little more complicated than Michelangelo, because David is a block of marble. “Applying it without overlapping was a bit of a job. The pattern was the challenge,” Lash-Doyle said. “In the annual moustache contest, this falls into the freestyle category,” Dawson said. Dawson does all kinds of stuff along these lines, all in the name of education and literacy. He and the kids did an all-nighter Friday into Saturday at the Gypsum library, which featured literary skill builders such as Zombie tag and running around the library with glow sticks in the dark. His kids have also won collectible figurines from pop culture. He told them to find what they like and he’d order it for them. It had to be under $10. Dawson is originally from Tucson, Ariz. 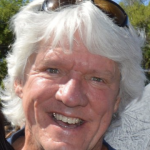 He worked in Yuma, Ariz., for a few years, doing things like teaching adults in computer classes. “It’s not nearly as much fun,” he said. Fun, as you can see, is the meaning of life, which explains why kids in his program now read for pleasure. He decided to go where the fun is. “I really wanted to work with teens in the mountains in a town under 10,000 population,” he said. He sent zillions of applications to places fitting those criteria. Gypsum and the Eagle Valley Library District was a hit. And that, more or less, is how he ended up with a rainbow-colored fauxhawk. Dawson wasn’t looking for attention when he did this, but he’ll get it. School starts next week and he’s meeting with principals. Next summer’s reading program focuses on sports. He said he hopes he doesn’t end up with a soccer ball on his head.